When you are a teenager, putting your best foot forward at all times is important. I sorta kinda forgot this when I became a mom, but it all came back to me when my son hit his teens. Everything was high priority when it came to his personal appearance. And now that my daughter is ten, those same issues are starting to appear with her as well. Tween to teen, growing pains occur. And when it comes to your teen’s smile, well, that is uber important. So you may find yourself having a straight talk with your teen about straight teeth—and thankfully, for those teens that need it, they have the option of getting Invisalign Teen. Most of us know about braces, and Invisalign Teen is an alternative to wearing traditional braces. Invisalign Teen have clear aligners that straighten teeth without the metal look of braces. These clear aligners are also removable. They give a more natural look than that of metal braces, which can be awkward and difficult to wear for some teens. Teenagers are already sensitive when it comes to their appearance and how they look—Invisalign Teen aligners are virtually invisible and work to straighten teeth effectively. This can also bode well for sports and activities because they are removable, which makes brushing and flossing a breeze in comparison to wearing braces. Invisalign Teen works the same as traditional braces and wire brackets to straighten teeth. They can help correct most teeth straightening issues, from major to minor cosmetic adjustments. And, Invisalign Teen costs about the same as traditional braces (check the Invisalign Teen Cost Calculator). There goes the myth that Invisalign costs more than braces—that is simply not true. It’s a win/win for your wallet and for you teen. Not all orthodontists specialize in Invisalign Teen, so to find an Invisalign doctor in your area that does, visit the Invisalign website. Most dental insurances cover Invisalign Teen just like they cover regular braces. You can check with your insurance carrier for specific coverage and cost. My son didn’t need braces, but as my daughter gets older, I am being told that that she will probably need them when she hits her teen years. I know that Invisalign Teen will be an option on the table for us once she hits the age benchmark. Invisalign Teen is holding a sweepstakes in which your child could receive Invisalign Teen treatment for free at no charge. The sweepstakes end October 1, 2014. 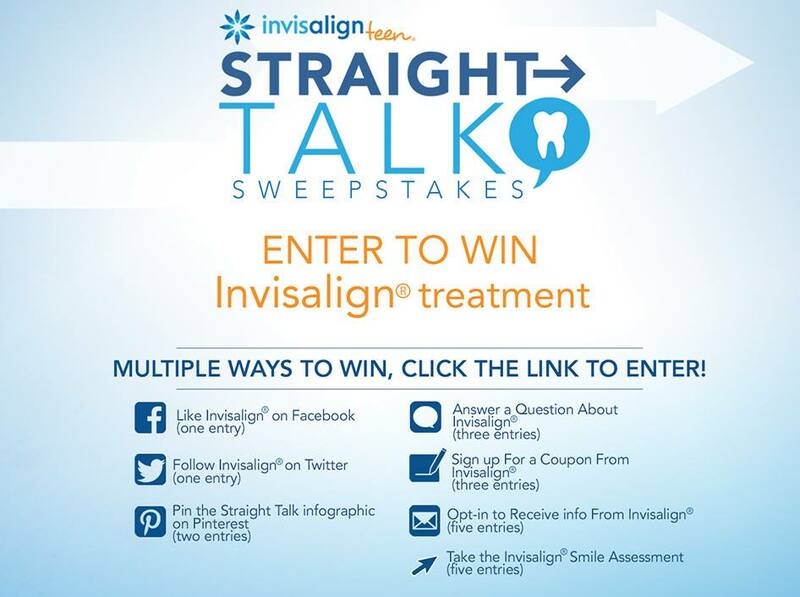 For more information, visit the Invisalign Facebook page. You can also take the Invisalign Smile Assessment to see if Invisalign Teen is right for your child. Now that we’ve had our straight talk, you are armed with the information you need about Invisalign Teen. What are your thoughts on Invisalign Teen compared to traditional braces?